NEW YORK – The New York Giants have made some roster moves already by signing WR Domenik Hixon, TE Jake Ballard and CB Bruce Johnson. The Giants have also released veteran RB Brandon Jacobs, who may want to test the market but return for less money and get that third ring we all know is coming to New York under QB Eli Manning. Come back to New York for a bit less Brandon, RB Ahmad Bradshaw is the No.1 RB in New York but the two players compliment each other well. Manning was also in the news this week for restructuring his contract to free up over $6.5 million dollars in cap space for 2012. The Giants will also need to pay DE Osi Umenyiora, who deserves to be paid a nice 3 or 4 year deal for consistent production on the field. Indianapolis Colts QB Peyton Manning was released by the team this week, in an emotional press conference which included Jim Irsay. He has already begun checking out teams, including Denver where he was spotted this week and Miami where he will be soon. The Washington Redskins make a bold move giving up three 1st round picks (2012,2013,2014) and this years 2nd round pick, for this years No.2 overall pick from the St. Louis Rams. A pick most believe will be used on QB Robert Griffin III. The New York Jets sign QB Mark Sanchez long term with a five year $40 million dollar deal. Even WR Plaxico Burress was in the news and suggesting a return to the G-Men is always a possibility. I don’t know about that one. It’s worth mentioning again how much I love the New York Giants using the franchise tag on punter Steve Weatherford. OL Kareem Mckenzie might be on his way out too. It sounds like the Giants are going to bulk up their offensive line this year which is a smart move. I would like to wish Brandon Jacobs all of the best in whatever he decides to do and Kareem McKenzie too, if he should leave. Of course, WR Mario Manningham is another big name floating around about possibly leaving the team. I hope that isn’t the case with Manningham but I wish him well too if he goes. The NFL draft is next month and I think the Giants could use their first round pick on an offensive player for a change. I love the idea of getting a 10-year offensive lineman like OG Cordy Glenn 6’5″ 345 pounds in round one or OT Mike Adams 6’6″ 320 pounds. Perhaps, a stud tight end like Dwayne Allen 6’3″ 255 pounds or Coby Fleener 6’6″ 247 pounds. I doubt they will use a first round pick on a running back but I can see them taking one within the first four rounds. Giants GM Jerry Reese seems to be particularly astute at finding gems within the RB groups in later rounds, so it could wander into round five. I haven’t heard anything about special teams coach Tom Quinn yet but that is an area I expect will be addressed soon. It looks like K Lawrence Tynes has become a good luck charm for Big Blue and P Steve Weatherford is a rock star compared to other NFL punters. Hixon will help the return game and I expect WR Jerrel Jernigan to be primarily used as a WR. RB Da’Rel Scott is one to watch too. The Giants should also lock up LB Chase Blackburn for 3 years if possible in my opinion. I expect a linebacker to be drafted within the first four rounds. Be sure to come back and check out my full draft analysis by position. 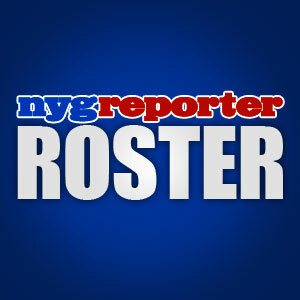 What are your thoughts on some of the recent roster moves by Big Blue? RD – nygreporter.com – RIP Alex Webster. This entry was posted on Saturday, March 10th, 2012 at 7:49 AM and is filed under 2012 Minicamp, 2012 New York Giants, 2012 NFL Draft, 2012 NFL Draft Class, 2012 NFL Schedule, 2012 NFL Training Camp, Big Blue, Bill Parcells, Chris Mara, East Rutherford, Eli Manning, Ernie Accorsi, G-Men, George Martin, Giants, Giants Coaches, Giants Draft, Giants Front Office, Giants History, Giants Mini Camp, Giants Roster, Giants Stadium, Giants Super Bowl History, Giants Training Camp, Giants Transactions, Hamps Camp, Jerry Reese, John Mara, Jonathan Tisch, Justin Tuck, Kevin Gilbride, MetLife Stadium, New Jersey, New Meadowlands Stadium, New York, New York Football Giants, New York Giants, NFC East, NFL, NFL Combine, NFL Draft, NFL New York Giants, NFL Schedule, Nilay Shah, NY Giants, NYG, NYG Blog, NYG Draft, NYG Exclusive, NYG Fantasy Football, NYG Minicamp, NYG Preseason, NYG Regular Season, NYG Reporter, NYG Ring of Honor, NYG Road Warriors, NYG Schedule, NYG Story, NYG Trade News, NYG Training Camp, NYG Update, NYG Website, nygreporter, Pat Hanlon, Perry Fewell, Steve Tisch, Timex Performance Center, Tom Coughlin, Tom Quinn, University of Albany, Wellington Mara. You can follow any responses to this entry through the RSS 2.0 feed. You can leave a response, or trackback from your own site. i like the moves.and i feel this will be a very interesting free agency tuesday.i absolutely love those three hundred plus pound offensive line-men you suggested.after rewatching the playoffs,i could cringe at the hits easy eli took and i know jerry reese will fix that toot sweet.everything else i feel really good about and very much agree a 3rd superbowl ring will be coming the gmens way soon. Hey Bobby, what do you think about them letting go of Jacobs? Were you surprised by that move. The Giants do not normally take players who aren’t the most athletic in round one, which obviously leaves out the o-linemen but they may need to bend their own rules for this year. I can see a third ring in this teams future for certain. i was a little puzzled with the g-men releasing jacobs because he came on strong when it counted throughout the playoffs and into the superbowl.i also heard he was willing to reduce his salary again,but if we look at the yards for the season,it was not a very good year.i really thought him and bradshaw complemented each other when the run game was in sync. I was too Bobby. I’m still hoping they can come to some sort of an agreement in the near future. it would be a smart move to get him because he knows the offense so well.